Stanford geophysicists have identified the triggering mechanism responsible for the recent spike of earthquakes in parts of Oklahoma-a crucial first step in eventually stopping them. In a new study published in the June 19 issue of the journal Science Advances, Professor Mark Zoback and PhD student Rall Walsh show that the state's rising number of earthquakes coincided with dramatic increases in the disposal of salty wastewater into the Arbuckle formation, a 7,000-foot-deep, sedimentary formation under Oklahoma. 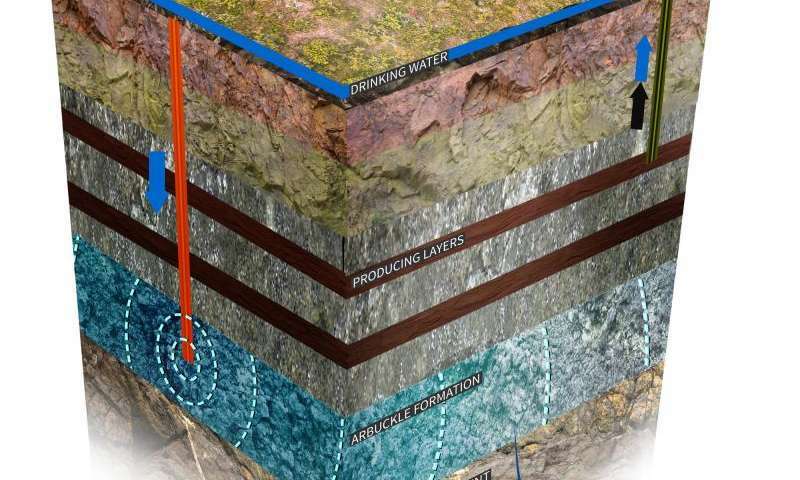 In addition, the pair showed that the primary source of the quake-triggering wastewater is not so-called "flow back water" generated after hydraulic fracturing operations. Rather, the culprit is "produced water"-brackish water that naturally coexists with oil and gas within the Earth. Companies separate produced water from extracted oil and gas and typically reinject it into deeper disposal wells. In the study, Zoback and Walsh looked at three study areas-centered around the towns of Cherokee, Perry and Jones-in Oklahoma that have experienced the greatest number of earthquakes in recent years. All three areas showed clear increases in quakes following increases in wastetwater disposal. Three nearby control areas that did not have much wastewater disposal did not experience increases in the number of quakes. "We know that some of the produced water came from wells that were hydraulically fractured, but in the three areas of most seismicity, over 95 percent of the wastewater disposal is produced water, not hydraulic fracturing flowback water," said Zoback, who is also a senior fellow at Stanford's Precourt Institute for Energy and director of the university's recently launched Natural Gas Initiative, which is focused on ensuring that natural gas is developed and used in ways that are economically, environmentally, and societally optimal. Active faults in Oklahoma might trigger an earthquake every few thousand years. However, by increasing the fluid pressure through disposal of wastewater into the Arbuckle formation in the three areas of concentrated seismicity-from about 20 million barrels per year in 1997 to about 400 million barrels per year in 2013-humans have sped up this process dramatically. "The earthquakes in Oklahoma would have happened eventually," Walsh said. "But by injecting water into the faults and pressurizing them, we've advanced the clock and made them occur today." Now that the source of the recent quakes in Oklahoma is known, scientists and regulators can work on ways to stop them. One possible solution, Zoback said, would be cease injection of produced water into the Arbuckle formation entirely, and instead inject it back into producing formations such as the Mississippian Lime, an oil-rich limestone layer where much of the produced water in Oklahoma comes from in the first place.